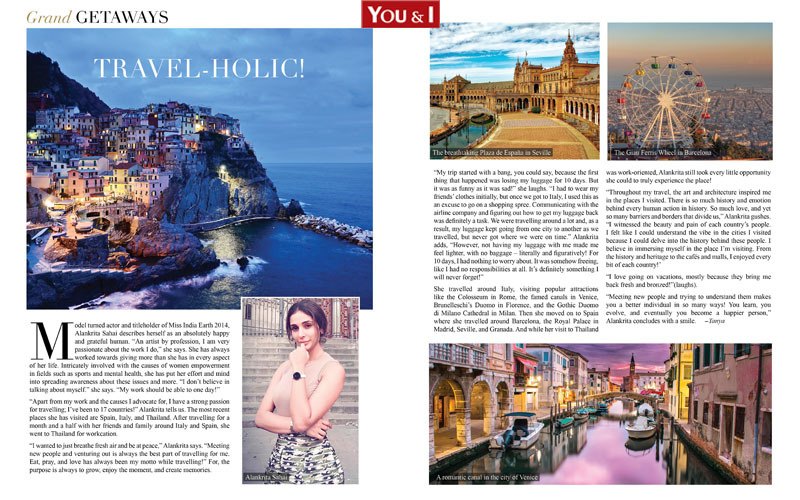 “Apart from my work and the causes I advocate for, I have a strong passion for travelling; I’ve been to 17 countries!” Alankrita tells us. The most recent places she has visited are Spain, Italy, and Thailand. After travelling for a month and a half with her friends and family around Italy and Spain, she went to Thailand for workcation. “I wanted to just breathe fresh air and be at peace,” Alankrita says. “Meeting new people and venturing out is always the best part of travelling for me. Eat, pray, and love has always been my motto while travelling!” For, the purpose is always to grow, enjoy the moment, and create memories. She travelled around Italy, visiting popular attractions like the Colosseum in Rome, the famed canals in Venice, Brunelleschi’s Duomo in Florence, and the Gothic Duomo di Milano Cathedral in Milan. Then she moved on to Spain where she travelled around Barcelona, the Royal Palace in Madrid, Seville, and Granada. And while her visit to Thailand was work-oriented, Alankrita still took every little opportunity she could to truly experience the place! “I love going on vacations, mostly because they bring me back fresh and bronzed!”(laughs). “Meeting new people and trying to understand them makes you a better individual in so many ways! You learn, you evolve, and eventually you become a happier person,” Alankrita concludes with a smile.